On Tuesday, Nov. 5 workers and their allies achieved important victories in elections in New Jersey, Washington, Massachusetts, Ohio, Virginia, and New York. A grassroots effort in New Jersey brought a campaign for a minimum wage increase to a victorious conclusion last night. Some 256 labor, community, religious, civil rights, student, women’s, and senior organizations got together to form the victorious Working Families United for New Jersey coalition. Their successful “Raise the Wage Campaign” gives an actual financial lift now to people all over the state of New Jersey who are finding it impossible to make ends meet or to feed their families adequately. This will put pressure on the re-elected governor, Chris Christie, to live up to the people’s will during his second term. In the state of Washington there was another wage increase victory with voters approving a ballot measure to hike the minimum wage for 6,000 low-wage Sea-Tec airport workers to $15 per hour and to provide them with sick pay and other benefits. In Boston, Massachusetts the people elected the Democrat, Marty Walsh, an active union member, for mayor. In Cincinnati, Ohio, the voters defeated in a landslide (78 to 2 percent) a city charter amendment that would have ended defined benefit pension plans for newly hired city employees. In Virginia, Terry McAuliffe, the Democrat, bested Ken Cuccinelli, the tea party Republican candidate for governor. Virginia is widely regarded as a bellwether state with last night’s results not boding well for radical right wing politicians all over the country. Cuccinelli, the defeated climate change denier, has advocated elimination of minimum wage laws, abolishing Social Security and Medicaid, ending all abortion rights and barring a range of sexual activities among consenting adults. The people of Virginia last night threw that agenda into the trashcan where it belongs. The McAuliffe victory in Virginia was also due in large measure to the massive effort by labor, women, civil rights and allies to turn out a huge vote in northern Virginia, a section of the state hit particularly hard by the recent tea party shutdown of the federal government. 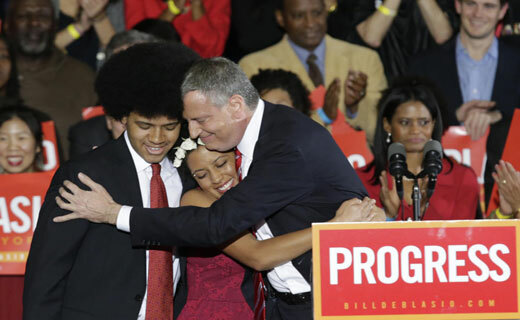 In New York, the voters overwhelmingly rejected 12 years of austerity politics by giving the Democrat, Bill de Blasio, almost 75 percent of the vote, making him the first Democratic mayor of New York City in more than 20 years. The people of the city, in electing de Blasio, took a powerful stand against an array of policies that benefit the 1 percent over the 99 percent. In every one of the five boroughs of the city de Blasio campaigned hard on the themes of ending the wage gap, ending inequality and ending racial profiling known as “stop and frisk.” African American, Asian, Latino and white voters overwhelmingly backed him and the progressive agenda he put forward. Last night’s election results showed that voters want good decent-paying jobs, good schools for their kids, health care and a fair share in the wealth they create. Last night’s election results were a rejection of the tea party and its shutdown of the federal government. They must be just the beginning, however, of a massive, concerted approach to the big mid-term elections coming up in 2014. All the people’s organizations will have to be mobilized if the candidates who represent the tea party, the extreme right and all the lawmakers doing the bidding of the 1 percent are to be defeated next year. In 2014 we must repeat the experiences of last night, only on a far bigger and better scale.